I want to thank everyone who worked so hard to make The 2012 General Assembly of The Universal Anglican Church a huge success. My friend Danica Potier was kind enough to lead us to The Country Inn & Suites Milwaukee Airport for our meeting location. The staff and facilities were wonderful – we couldn’t have asked for more! My wife Erin, as always, makes our meeting possible by her loving presence and willingness to help wherever needed. This year we added meal planning to her plate, and she came through with delicious, diverse, and healthy meals from area restaurants and caterers. A special thanks to our presenters: The Rev. Jerry Roy, The Rev. Tammy Dutcher, The Rev. Kevin Ewing, The Rt. Rev. Jeffrey Montoya, and my brother from another mother The Rt. Rev. John Selders. A warm welcome to our new priests, The Revs. Arthur Edward Holm, John Lowey, and Gerardo Serna. Of course, it is the people who attend that make any meeting what it is. 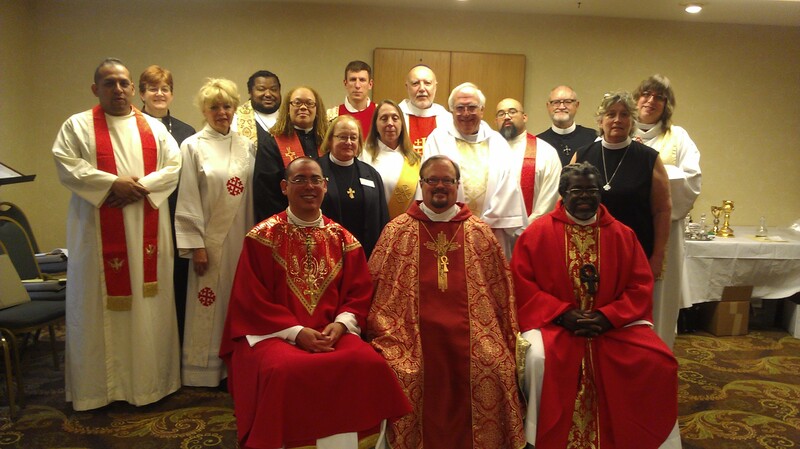 Pictured above in the front row from left to right are Bishop Jeffrey Montoya, Bishop Craig Bergland, and Bishop John Selders. Behind them from left to right are The Revs. Gerardo Serna, Chrystal Reichard, Lynette Corsten, Kevin Ewing, Jackie Gilchrist, Ann Barker, Samuel Christensen, Denise Gaetz, Jerry Roy, Ed Holm, John Lowey, John Surinchak, Rebecca Pierce, and Tammy Dutcher. The energy, vision, wisdom, and steadfastness of these distinguished members of the clergy is outstanding. It surely was the most powerful General Assembly in our history! Next year we celebrate our tenth anniversary. I can hardly wait! Between now and then, however, there is much to be done. If you would like to explore your call to ordained ministry in The Universal Anglican Church, I invite you to contact me at craig.bergland@gmail.com!